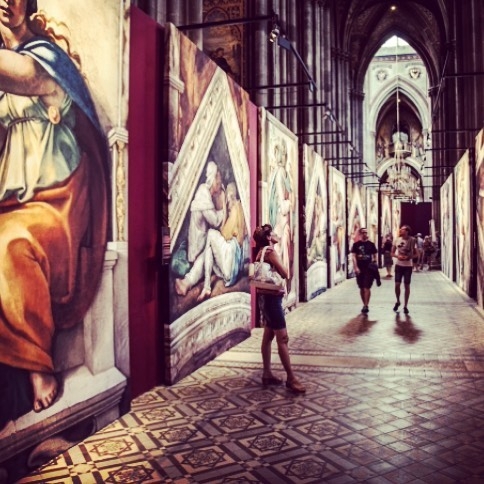 We are happy to welcome you in the name of the Protestant church community St. Petri-St. Marien in the exhibition “Michelangelo’s Sistine Chapel” in the Parochialkirche. The Parochialkirche was once built as a sign of religious tolerance in Berlin, at the beginning of the 18th century. 34 frescoes are reproduced photographically and artfully displayed in their original size. This innovative interpretation of these timeless masterpieces can be viewed up close, including The Creation of Adam and The Last Judgement. With your ticket, you support a project of our church community that is already taking shape at the Petriplatz – the House of One. Jews, Christians and Muslims are working together to build a house, under whose roof you will­ find a synagogue, a church and a mosque. Thank you very much for your support.